Over 100 stickers of all types of cars to place in colourful scenes including a race track, a busy city scene and at the garage for repairs. 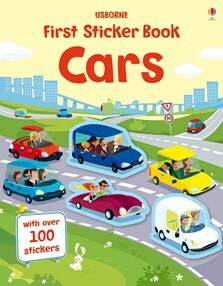 Includes stickers of race cars, campervans, ambulances and more, as well as a special page of cars throughout history. A perfect gift for any small car enthusiast and ideal for learning and talking about different vehicles.